Amazing Black Bean Brownies: good for your heart, make you etc. My last post was a recipe post, I guess. More, it was just a suggestion post. This here is my first post where I actually experimented with ingredients and made foods that did not taste like crunchy water! I have an ever-increasing backlog of recipes that I kinda-sorta want to try, but will probably never get to. Homemade Marshmallow Peeps. Vegan, fat-free carrot cake. Pumpkin muffins recommended by my friend Silliker. Various veggie burger recipes. They all incite some sort of interest in me, but not enough to send me right to the oven to work the ol’ Spoodles magic. 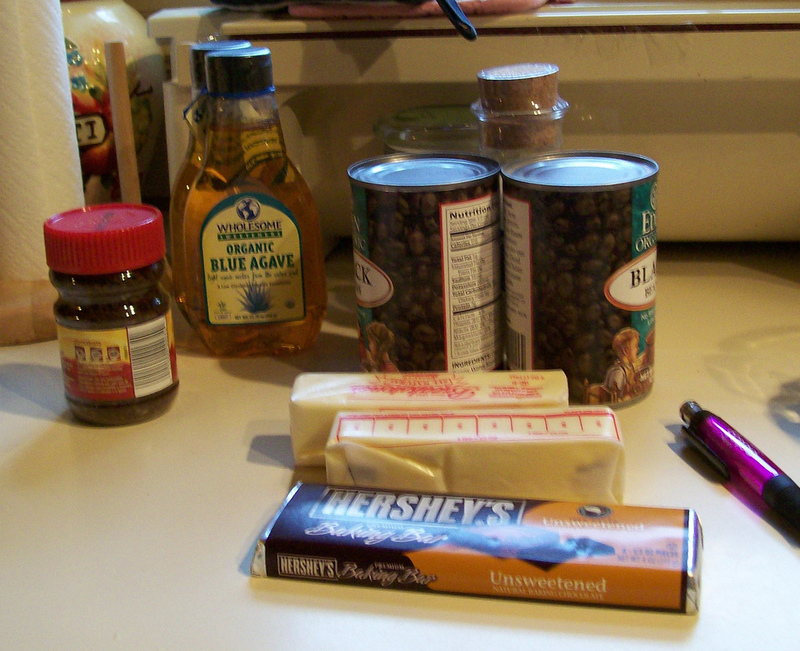 I was blogrolling on Monday; The moment I saw the phrase “Black Bean Brownies” on 101 Cookbooks, I knew. The words made absolutely no sense to me. I mean, sure. I knew what they all meant individually. Black–an absence of color. Bean–a protein-filled treat that develops in pods. Brownies–chocolatey delights. When you put the three together? The phrase “Black Bean Brownies” sounded like “Cotton Ball Checkbook” or “French Fried Pants.” The words simply did not go together in any decipherable way. I was going to have to create this recipe. Immediately. Closer inspection of the recipe showed that black beans were not the only experimental item. These brownies were sweetened with agave nectar, a sort of natural, healthier (although, obviously, by no means healthy) corn syrup. The recipe initially comes from Baking With Agave Nectar: Over 100 Recipes Using Nature’s Ultimate Sweetener, which at $11 is actually close in price to what you’ll pay for damned agave nectar in this one recipe. For the sake of trying new things, I did spring for the organic agave nectar, but 101 Cookbooks says that you can easily replace the nectar 1:1 with honey. I won’t reprint the recipe here (as I probably don’t have permission), but here are my notes. This was only my third time baking, so I was prepared for it not to go…smoothly. The recipe stated that canned black beans worked just fine for this project. I bought canned, no salt added beans, and they seemed to work fine. With the usual, high-sodium canned stuff, you would probably want to spend a good amount of time rinsing the beans. I made the decision not to include the walnuts. My family is fairly picky when it comes to such things, and I thought these brownies were weird enough due to the beans and the sweetener. Didn’t want to rock the boat too much. As mentioned in “Final Thoughts,” this may have affected my final batch. Inexperienced as I was. I was unsure what the instruction “Bake…until the brownies are set” meant. Did I want them to come out of my oven looking like I wanted my final product to look? Or did I want to take them out a little soft (still solid), and the heat from the baking process would finish it all the way? I checked on my brownies at thirty-five minutes and they seemed a little…shiny. Internet research seemed vague at best, although if I had followed Slashfood’s direction I probably would have fared better. At forty minutes , I removed the pan and hoped for the best. 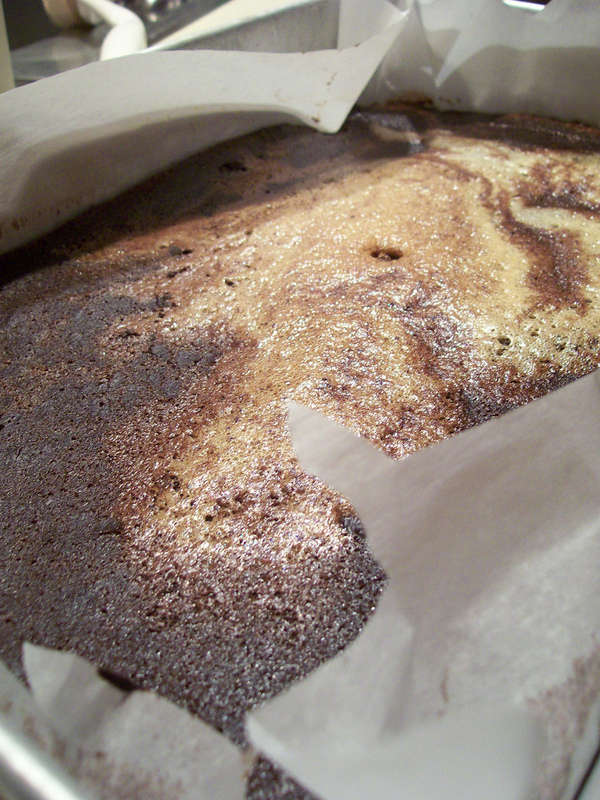 After cooling (and after refrigerating, as specified by this recipe), my brownies were still gooey. Not uncooked-gooey, and not inedible-gooey, but certainly too gooey to cut out of the pan with any confidence. I knew that if I put these things back in the oven after they’d cooled, they would only burn. I was left with some extra-gooey fudgeypuddingbean brownies. That said, these things tasted really good. There was no bean taste to them at all. They tasted like super-decadent, fudge brownies. The coffee flavor was pretty strong, but not bad at all. Even the consistency wasn’t terrible. Certainly softer than I would have liked–and softer than any brownie I’d ever eaten before–but I could pick them up with my hands without them falling apart, so that was good enough. Mom: “Is there coffee in this?” She didn’t seem entirely unimpressed, but didn’t enjoy the flavor all too much. I offered her another the following day, and she accepted. Conclusion: not poison. Brother: I didn’t even bother asking. He ate a cheeseburger instead. Coworker 1: “I’m impressed!” “This is more like fudge than a brownie.” Later, “I have a brownie craving!” As one of my better friends, she might have been tempered by pressure not to hurt my feelings. Coworker 2: “Those brownies were…interesting.” After some hesitance, she came out and said, “I think I’m so used to [regular sugar] that these just don’t hit my craving.” She also expressed that she liked my previous two baking attempts far better (Toll House Cupcakes and Chocolate Cherry Dr. Pepper Cupcakes). Note to self: less adventurous baked goods for the office. This was actually my favorite bit of feedback, simply because it was actual, constructive criticism. I’ll come back to her because I know she’ll actually tell me how she feels about the food. I’m hoping it will be complimentary, but I know it won’t be needlessly so. I loved the taste of these brownies, and specifically how the instant coffee offset the chocolate flavor. However, the coffee did tend to come front-and-center. I think the amount of coffee could stand to be cut in half (unless it was used to mask some sort of beany aftertaste that I didn’t sense at all). This would, I think, make my family far more receptive to these brownies. I left the walnuts out of the recipe, and now I’m wondering if they would have helped to bind the mixture and make for a more cohesive and less goopy brownie. I don’t believe nuts actively bind food, but you never know. Since my family didn’t eat more than one of these apiece anyway, I would probably leave the nuts in next time for a more full and textured brownie. I was too much of a wuss to pull a fast one on people. When consumers asked me about the brownies, I came right out and told them they were full of beans and alternative sweetener. It would have been interesting to put these brownies to a blind taste test. Would these just seem like “super-fudgy” brownies, or would people notice something awry? I really like the idea of using beans in a recipe instead of flour. 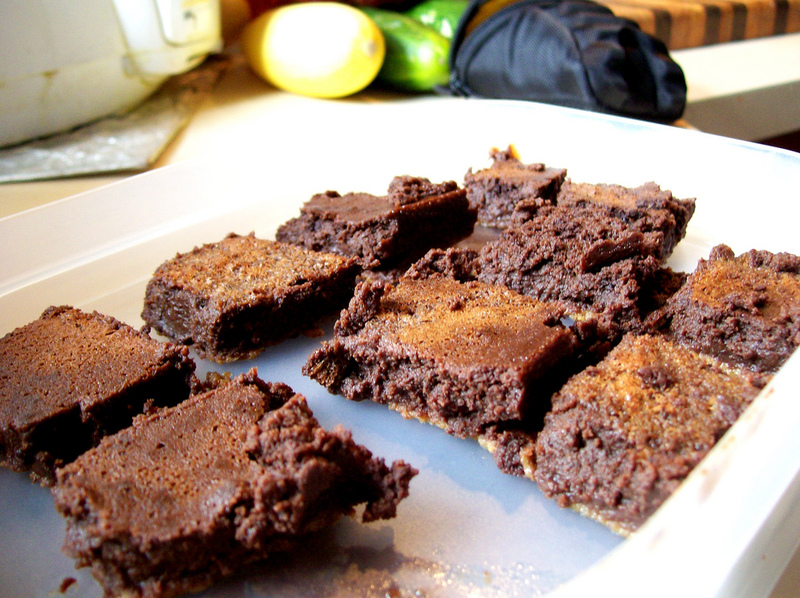 It adds a world of protein and fiber that you aren’t going to get in a regular brownie. This makes them more substantial, more filling, and–dare I say it–more satisfying than a normal baked good in a lot of respects.